Along with all the variation in promotions, we saw an absolute bounty of different wrestlers to place in the poll. 426 different competitors graced the ballots this year. However, of those 426, there were only 52 that made their way on to 10 ballots or more. There was an incredible amount of variety. And it wasn’t all 10th place pity selections, either. Kagetsu, for instance, only made three different ballots, but she received three first place votes! Let’s pick through this wrestler data and see what interesting tidbits we can find. This year, 20% of the wrestlers selected by the voters are female. The woman who showed up on the most ballots was, surprisingly, Charlotte Flair. For all the talk about how Becky Lynch owned 2018, our voters weren’t as likely to put her on their ballots. Five more voters named Charlotte than Becky. Charlotte had one more match than Becky and six more votes total. When it comes to total points, Charlotte had 179 to Becky’s 142. For points per vote, Charlotte tops Becky 5.59 to 5.46. If we drop the Women’s Royal Rumble, we lose one vote and one point from Becky’s totals. (We don’t lose a ballot, as the voter who voted for WRR also has Becky higher on his list in another match.) That gives Becky only three matches, but 141 points for new points per vote of 5.64. That’s higher than Charlotte, but by less than 1%, so we can just go ahead and call that even. However, all three of Becky’s matches include Charlotte! Outside of the Women’s Royal Rumble, Becky didn’t get a single match on the list without Charlotte being involved in it. Meanwhile, Charlotte’s match with Asuka at WrestleMania and her Survivor Series match with Ronda Rousey both received votes. If you’re talking buzz, there’s no question that Becky Lynch is the hottest superstar in perhaps the whole company at this point. 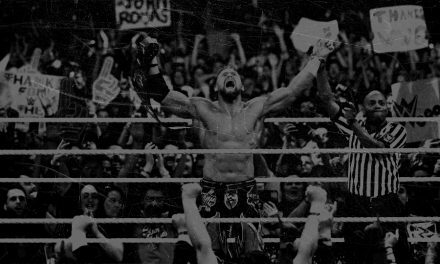 When you look at our Match of the Year data, however, it appears that a different picture is being painted between the ropes. Could you argue that had Becky not been punched in the head that she would’ve have had a match with Ronda that our voters would have liked just as much? That’s definitely possible, but thanks to Nia Jax, we’ll never know. As I mentioned earlier, only 52 of the 426 wrestlers appearing in the poll found their way to 10 ballots or more (12.21%). Of those 52, five of them made it on the strength of a single match. A-Kid, for example, had a viral hit with his match against Zack Sabre Jr. It was the talk of the internet wrestling world for a while, receiving high praise from our Flagship Podcast, Dave Meltzer, and many others. It was the only match A-Kid would receive votes for this year, but 12 different voters, virtually 10% of the field, included it in their ballot. 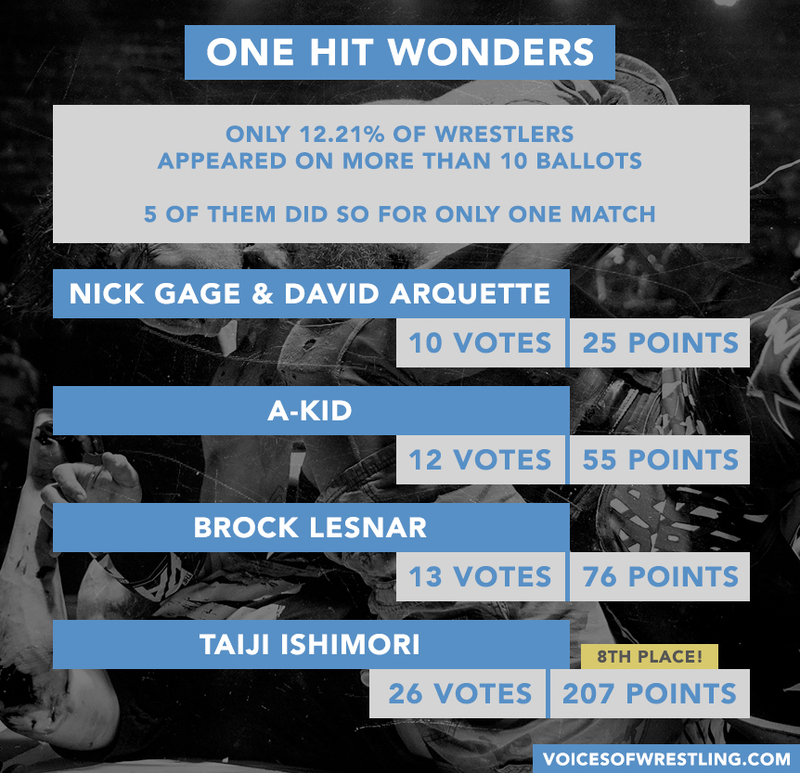 Nick Gage almost murdered David Arquette and ten of our voters took notice of that, as well. It didn’t place all that high on people’s ballots, receiving only 2.5 points per vote (averaging out to people’s 8th or 9th favorite match), but it was certainly notable. Brock Lesnar wrestled Roman Reigns and Braun Strowman a lot in 2018. That’s not exactly the recipe for a year full of Match of the Year Contenders. The only Brock match to make an appearance this year was his only big show match that did not include either of those opponents, the Survivor Series showdown with Daniel Bryan. It made 13 different ballots and got twfirst-placece votes. It received 5.85 points per vote, which puts him in the top 25 of wrestlers who received more than 10 votes. The people who liked this one, really liked it. The real One Hit Wonder this year, though, was Taiji Ishimori. He only got one match in the poll, but it made the top 10, earning 207 total points and 6 first place votes. It appeared on 26 different ballots, earning a whopping 7.96 points per vote. He only had 1 match make the entire list, but still, Taiji Ishimori finished in the top 20 in total points with 207. What a match and what a performance from Ishimori and Takahashi. Only five wrestlers managed to have ten or more matches make the list. (Kenny, Okada, and Bandido were this close!) Kota Ibushi had exactly ten, Fenix had 12, Zack Sabre Jr. had 13, WALTER had 14, and Will Ospreay had an impressive 16 matches. That’s a lot of Match of the Year Contenders to have in one year! Ospreay, WALTER, and Ibushi all did much more than rack up match count. 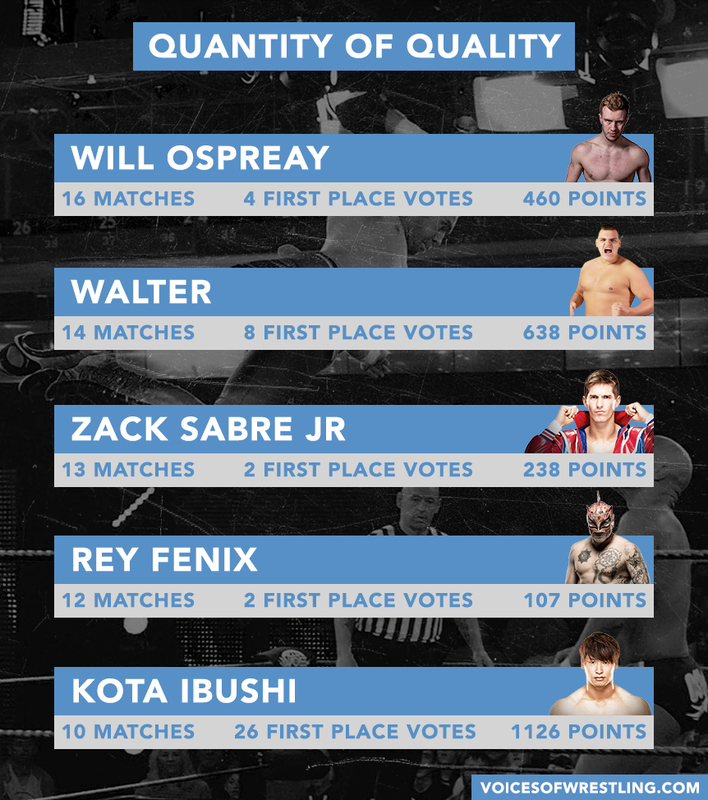 Ospreay’s OTT match against WALTER came in at number 11 overall and got 2 first place votes. WALTER did land in the top 10 with his match against Jordan Devlin that just barely squeezed past Takahashi and Ishimori for 8th place. The real standout here, though, was Kota Ibushi, who had 10 matches make the poll, but had three of those matches make the top 10! When you add up total points, Ibushi stomps WALTER and Ospreay, with this 1126 points surpassing WALTER and Ospreay combined. The performer who really stands out amongst the field, though, is Kenny Omega. His 2018 is phenomenal by any metric. 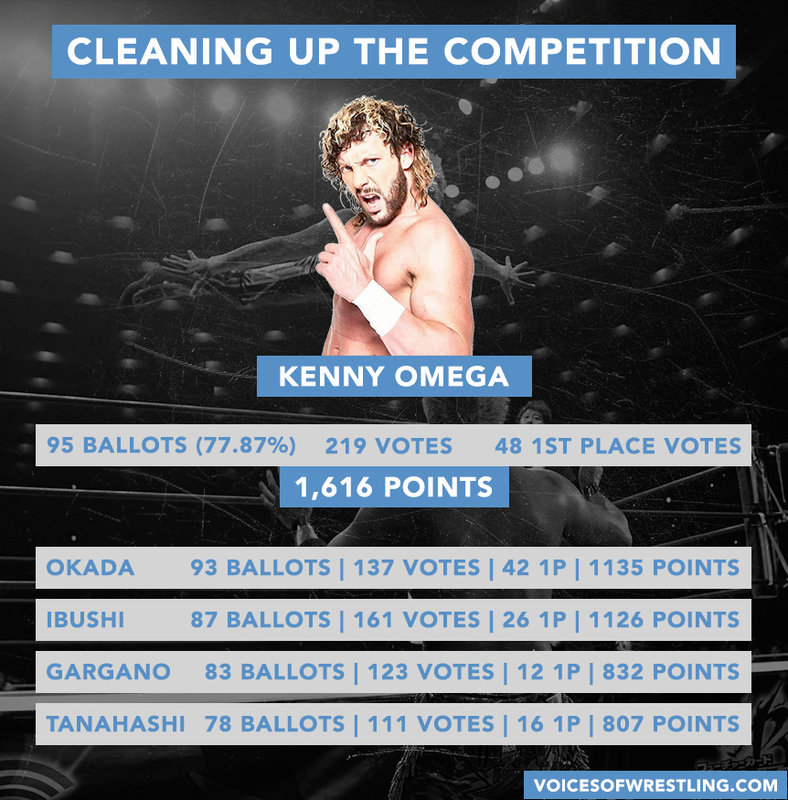 More people voted for Kenny Omega than any other individual; he made 95 different ballots (77.87%). When it comes to total votes, the gap is gigantic between him and anyone else. He collected 219 votes while the next best, Kota Ibushi, only received 161. Of the top 10 matches in the poll, Kenny appears three times. He appears 6 times in the top 25. (He also appears again at 28.) First place votes? Kenny bests everyone with 48. Okada comes in second with 42, but, of course, 39 of those are his match with Kenny Omega. The real eye-opener is the total points. Omega blasts ahead of the field with a mammoth 1,616 points. For comparison, if you added #2 Kazuchika Okada’s point total to #8 Tomohiro Ishii’s, Kenny still beats them. 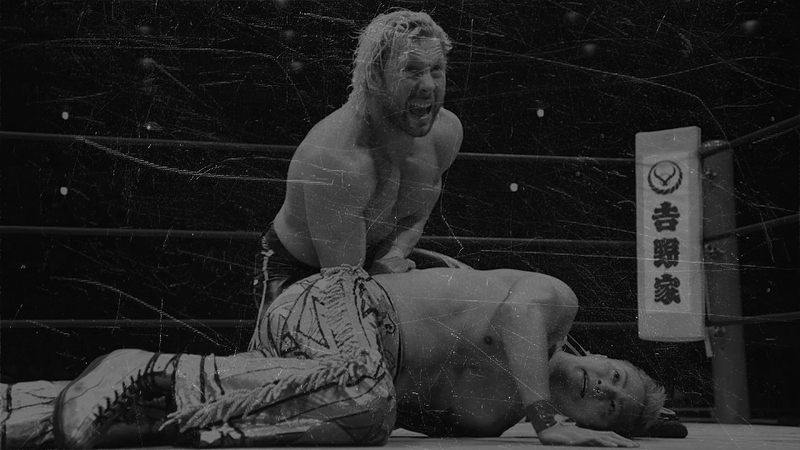 Any way you want to slice it, Kenny Omega dominated 2018. Trying to predict 2019 based on the 2018 results is an even trickier prospect than it would normally be, given the changing landscape in the industry. Kenny Omega already has one strong contender for this year’s list, but will he even be wrestling for New Japan Pro Wrestling this year? How many matches of his will even air this year? If Omega does leave New Japan, who will pick up the slack? Smart money may be on Jay White. 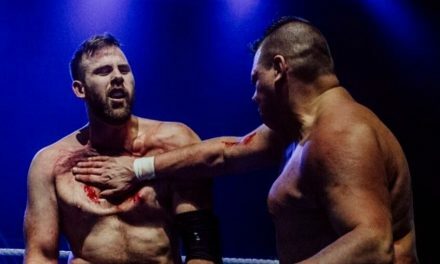 White only had 2 matches receive votes for 2018, but with a strong showing against Okada at Wrestle Kingdom, he might just be one to watch for 2019. 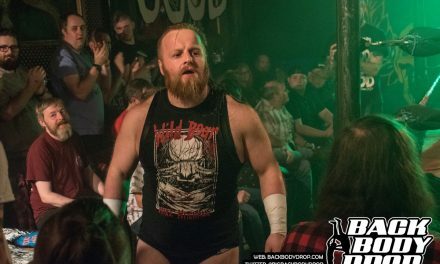 WALTER had 14 matches across seven different promotions in 2018, but he has recently debuted in NXT UK after signing a contract with WWE. It’s hard to believe he’ll even have the opportunity to have 14 Match of the Year Contenders in 2019. He’s not the only one, as Bandido has signed with Ring of Honor limiting the places he’ll be able to work. The Lucha Brothers seem to have some sort of agreement in place with All Elite Wrestling, what will that mean for their 2019 output? Who knows who might jump to a new company that offers fresh matchups and opportunities? 2018 was a great year inside the ropes and if this first month has been any indication, 2019 may not only offer that, but plenty of excitement outside of them as well.